At SIHH 2015 Cartier will unveil a new version of its inverted tourbillon that reveals most of the movement on the dial, this time with a sun-ray guilloche dial made of 18k solid gold. 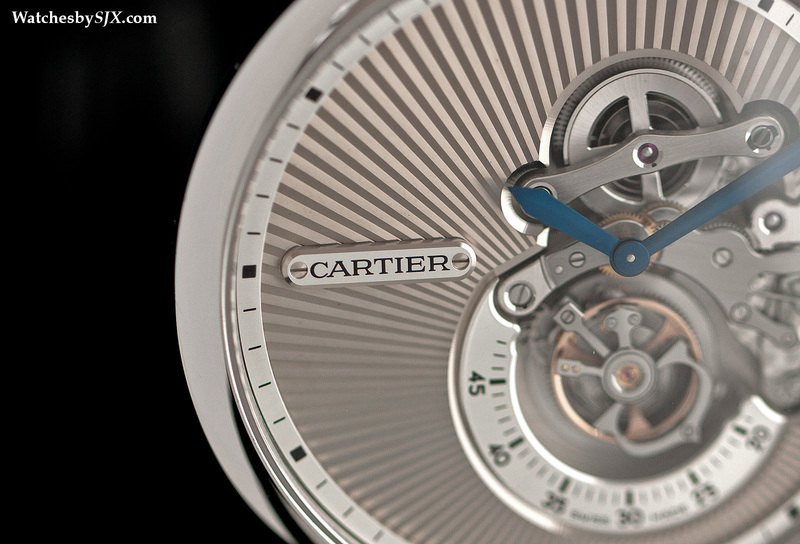 Cartier‘s head of movement development, Carole Forestier, is one of the few female technical directors at a watchmaker. And perhaps because of her gender, the movements she has conceived, like for the new Crash Skeleton, are often as much technical creations as they are aesthetic. The Rotonde De Cartier Reversed Tourbillon exemplifies that dichotomy, being a haute horlogerie complication that has been constructed for visual impact. The calibre 9458 MC was originally developed to do two things: reveal the mechanics of the tourbillon movement by inverting the calibre, and provide a large blank canvas on the dial for decoration. 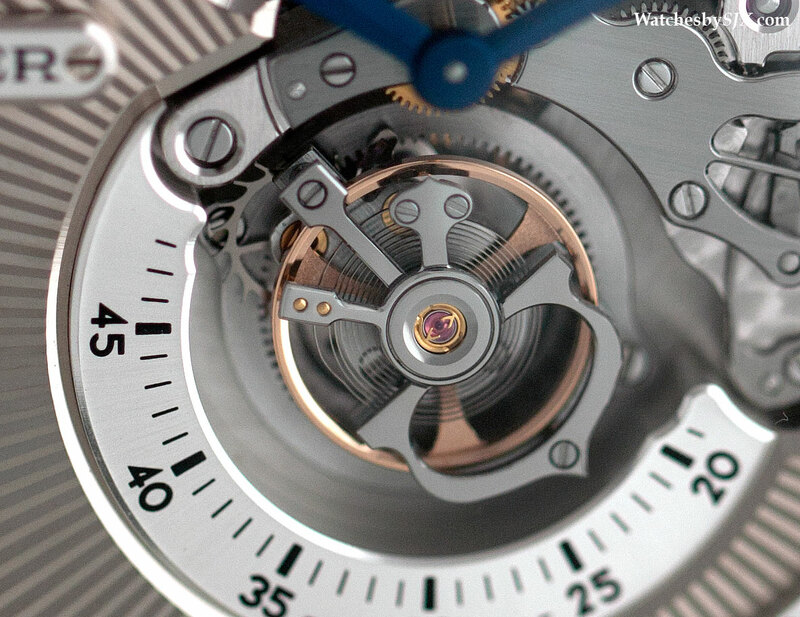 A variation of the flying tourbillon calibre used widely through its Fine Watchmaking line, the 9458 MC is open-worked on the dial side, with the mainspring visible through an open barrel. Just below that is the gear train and keyless works, with the flying tourbillon at six o’clock. The rear of the watch is a full plate that reveals little except for the winding click spring. Made of 18k white gold, the dial is decorated with a vivid sun-ray guilloche, radiating outwards from the tourbillon, making the guilloche slightly off-centre. 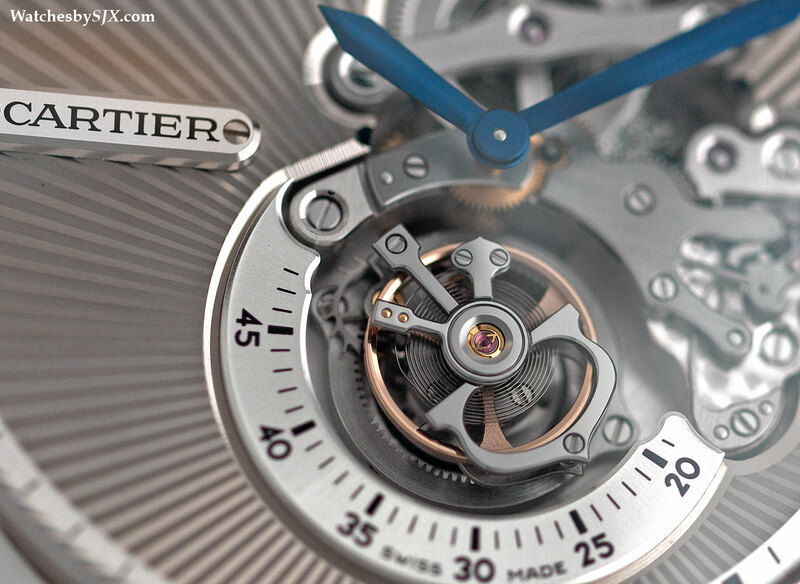 It is comprised of four parts, the main guilloche disc, as well as the minute chapter ring, semi-circular seconds track below the tourbillon, and the plate for the Cartier logo, all of which are secured by pins to the dial. Because the white gold dial is unplated (the alloy is usually plated with rhodium to give it a bright, white look), it has the distinctive greyish-silver hue of raw white gold. The case is rhodium-plated white gold, and the contrast with the colour of the dial is obvious. 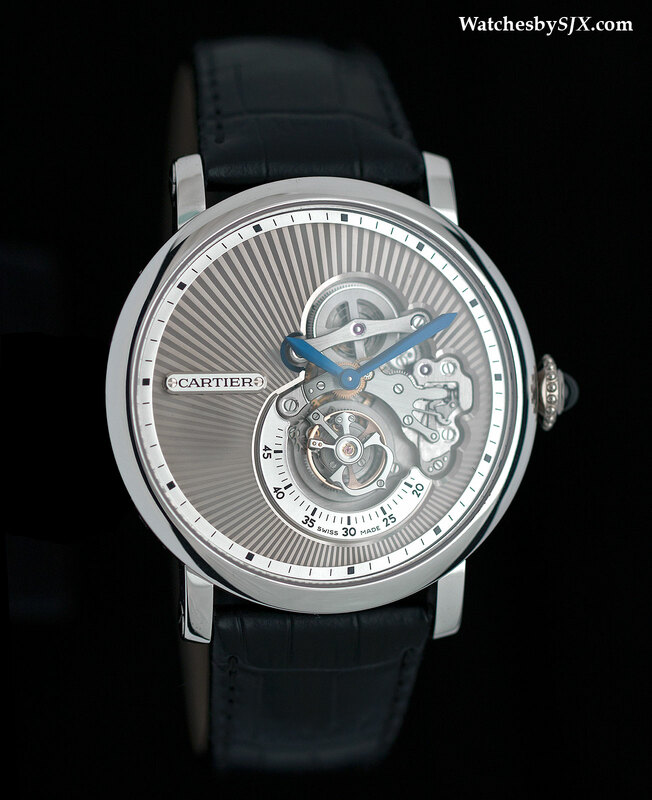 The Rotonde De Cartier Reversed Tourbillon has a 46 mm white gold case and is limited to 100 pieces with a retail price of €100,000, equivalent to about US$124,000. 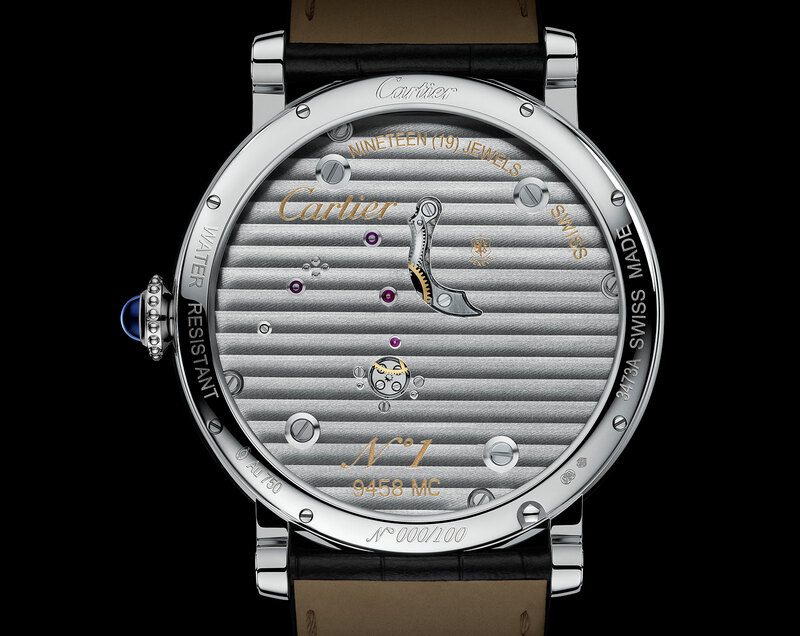 A 50 piece limited edition in platinum with a diamond bezel is priced at €170,000. And 20 pieces in platinum with diamonds on the dial and bezel will cost €440,000 each. Finally the top of the line model is in platinum with a matching bracelet, both completely covered in diamonds. Only five will be made, with a price tag of €1.16 million.